We received CIPA’s data for August of 2018, and plugged it all into our spreadsheets, but first, the overall outlook. Overall shipments rebounded a bit year on year from last month. 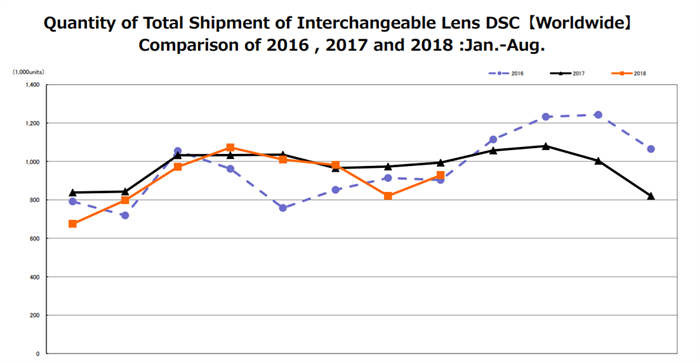 This is no great surprise because something strange happened with DSLR shipments to Europe in July, which has affected the year on year results. This month we see shipments near the same level as 2017 which indicates that 2018 is pretty close to 2017’s levels and will most likely remain so for the rest of the year. The big news of Nikon and Canon mirrorless product won’t be seen in this month’s shipments. Nikon would have started shipping in September, and Canon may have even waited until October to ship. We see this in the data, as DSLR shipment went up for all regions, especially Europe, with Japan shipments remaining relatively flat. 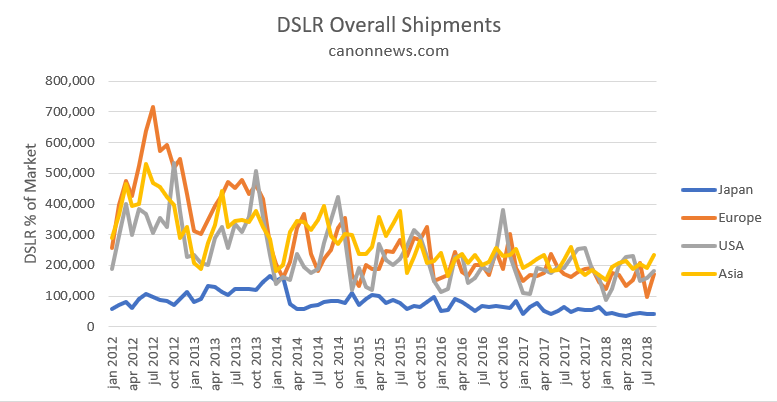 Overall, DSLR shipments have been remaining consistent for the last 8 months, while MILC shipments have been trending downwards since April of this year, after reaching their peak this year with the A7 III release. We expect that for September and October CIPA shipments for mirrorless shipments to take a dramatic increase as Canon and Nikon distribute brand new products to their distribution channels. One thing is certain, Canon and Nikon could read the tea leaves to what was happening in the larger markets, that were predominantly DSLR for the longest of times. The total value of shipments has eroded sharply from the America and Europe markets over the past 2 years. While it seems to be leveling off, Canon and Nikon getting into the market with high-value units will further increase the shipment total unit values for mirrorless and decrease the market share by unit values for DSLR’s. The unit values for mirrorless remain consistent as they have for most of this year, with Asia, Europe, and Japan all having average unit value far less than what the Americas has. We expect this to widen even further with the release of Nikon and Canon mirrorless units. It also continues to highlight the predicament of mirrorless vendors having to sell to two different market types; one high-end high value, and the other more focused on cheaper units. We are looking forward to seeing the results of September and October and how dramatically the shifts happen to end this year. It’s been a while since Nikon or Canon has brought their full marketing and distribution to bear and it should make significant changes to the market throughout the world. Those waiting and predicting the rise of mirrorless and the fall of the DSLR will finally start to see their wish fulfilled in the coming months, as Canon and Nikon enter the market fully.